I was first exposed to the Ninja Selling concepts through an installation in April 2016. An installation occurs when a certified ninja instructor travels on-site to teach a group of real estate professionals, typically from the same brokerage, the mindset skills and sales techniques that make-up the ninja way. I walked away impressed. Most sales training is filled with high pressure sales and closing techniques. Instructors teach how to cold call and get people to say ‘yes’, to sign on the dotted line. A ninja selling installation is the antithesis of the “classic” sales rally. For the first two-and-a-half days, the instructor (Don Tennessen in my case) taught skills that helped people create a positive mindset. He focused on what they call, quite simply, personal mastery. He presented exercises and techniques that one could incorporate into a daily routine. He talked about the importance of building relationships with people, not how to “close” them. It was refreshing and energizing. Kendall’s book is effectively a user’s manual for Ninja Selling. Would I call it a replacement to attending an installation? No. The camaraderie and relationships that are built during an installation are indispensable. They are a large part of what you get out of attending the event. 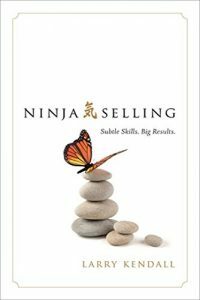 However, the book is a great source of reference material and a great way to stay engaged with the ninja selling system. Despite the real estate focus in Ninja Selling, I still consider the book a Must Read. There’s just too much valuable information that one can take from the book and apply to life, regardless of your profession or employment status. In addition, Kendall references a lot of reading material that influenced him and shaped the Ninja Selling philosophies. I picked a number of book recommendations through Ninja Selling, and I haven’t been disappointed with any thus far. You can learn more about Ninja Selling, what it is, and what’s it all about at their website – http://ninjaselling.com/.